Downtown artistry is not necessarily geographically bound. While an overwhelming majority of what encompasses Downtown Manhattan life in the mid-to-late 20th century physically exists below 14th street, there is a significant amount of artists who have seen their success come to a fruition in other parts of New York City. Fales Library’s Downtown Collection is synonymous with a rich archive of traditionally Downtown artists spreading the spirit of the experimental, post-modern art scene into new spaces. One of these spaces was the South Bronx Fashion Moda building, first opened in 1978 by Stefan Eins. Conceived as a mere space for contemporary art, Fashion Moda hosted a variety of non-traditional, conceptual forms of art installations and showcases created by artists all over the city, creatively encapsulating the edgy downtown style, and marrying it with the up-and-coming urban charm of graffiti art. The result was a dedicated area for the exploration of What is art? In a context where traditional schooling, formal education, and classic talent were largely overlooked. While exploring Fashion Moda’s rich archive, it is interesting to note that many artists of the late 80’s and early 90’s had their start with exhibitions in the Third Avenue building. Fashion Moda was also able to bring local New York artists out of the city, with showcases in Colorado, a noteworthy influence in California, and international ties. More interestingly, the building was able to form relationships and bonds between artists and figures who were of wildly different backgrounds, mediums, styles and futures. The joint nature of the effort gave a background, a home, and a shelter to many who refused to relinquish the predominantly avant-garde style that the 1960s had offered, and thus, with the rise of culturally black artistic movements, like hip hop music and graffiti art, the new home of the artistic persuasion reflected its targeted demographic. Perhaps, the piece that most accurately reflected this union was an undated shot taken at the Fashion Moda headquarters. In this black-and-white photograph, we see five men engaging in a friendly, almost candid shot. We see them posing, overtly serious, but inwardly engaging in a shared mission, a frame of unity in which people of different ethnicities and stylistic and cultural backgrounds come together to embody a new movement: these people are rapper Easy-G, founder Stefan Eins, artists Marc Brasz and Chris “Daze” Ellis, cultural icon Keith Haring, fashion enthusiast Wendell Headley—the moniker of Earl Lee Day, and a dubious shadow, perhaps that of the equally mysterious Willie Neal. Out of everyone pictured in the photograph, rapper Easy-G Rockwell is perhaps the least well-known.At the time—presumably the mid-80s—he was active in a hip-hop group known as Original Concept, which also featured Rapper Gee (Gerald Gray), T-Money (a future Yo!MTV Raps host), and the future Beastie Boys DJ and widely-acclaimed producer Doctor Dre. Easy-G’s only credit remains the only release ever put out by the foursome: Straight From the Basement of Kooley High! which was finally put out in 1988, when the group was signed to Def Jam records. While the four were destined to part ways, one of their singles, “Can You Feel It” became one of the most sampled hip-hop beats of the 90s, defining the decade to come in terms of urbane, street music. His involvement with Fashion Moda remains largely undocumented save for this photograph, but the legacy of Original Concept serves to greatly sonically espouse the artistic tradition of the designated space. Austrian-American artist Stefan Eins stands by G-Easy’s right. After having grown up in Europe, he settled in New York in the late 1960s. Ten years later, he founded Fashion Moda as a cultural concept at the time. Eins was an artist himself, who devoted much of his entrepreneurial endeavors to showcasing different creators at Fashion Moda’s Bronx headquarters, but was equally as dedicated to his own artistic creations, which regularly were shown in prestigious artistic institutions, such as the National Gallery in Vienna and New York’s Museum of Modern Art. By working at Fashion Moda, Eins developed a more conscious knowledge of graffiti art and contemporary painting, seeking to focus the efforts of the gallery space in the presentation of emergent, up-and-coming, often underrepresented artists. Amongst the artists that defined Fashion Moda’s multi-decade run, Marc Brasz remains one of the most prominent. Known for his traditional portrait paints, like Eins, he was able to score a MoMA showcase in 1984, which lasted for about two months. Most recently, Brasz’s work has been featured in another Bronx showcase in 2015 called “Fashion Moda: 35 Years Later” which features one of Brasz’s most notable oil portraits called “Portrait of Noc,” which features a smiling African-American sporting an afro haircut, and a purple car, along with a busy, colorful street in the background. Once again, not only is the art world embedded within this creation, but a traditional medium of creativity is finally espoused with a more urban-conscious subject matter, which sought to encapsulate a world which was rarely seen in galleries. Also catalogued in “Fashion Moda: 35 Years Later,” was the artist standing next to Brasz in the photograph, Chris Ellis, better known by his pseudonym ‘Daze.’ His artwork is called is “Soul Service Lounge” and aims at a more experimental and detailed style than that of Brasz. Graffiti art is masterfully doodled in green at the tops of what appears to be a dimly-lit underground speak-easy, where a number of minority groups appear to be spray painting, smoking cigars and listening to music, while lurking in the shadows. Daze has remained a relevant figure in nowadays’ art scene, engaging with the modern web to share his favorite art. In fact, on his official website ‘Dazeworld’ he can be found archiving a variety of both abstract and surreal material, always blurring the lines between graffiti art and a traditional oil paining. 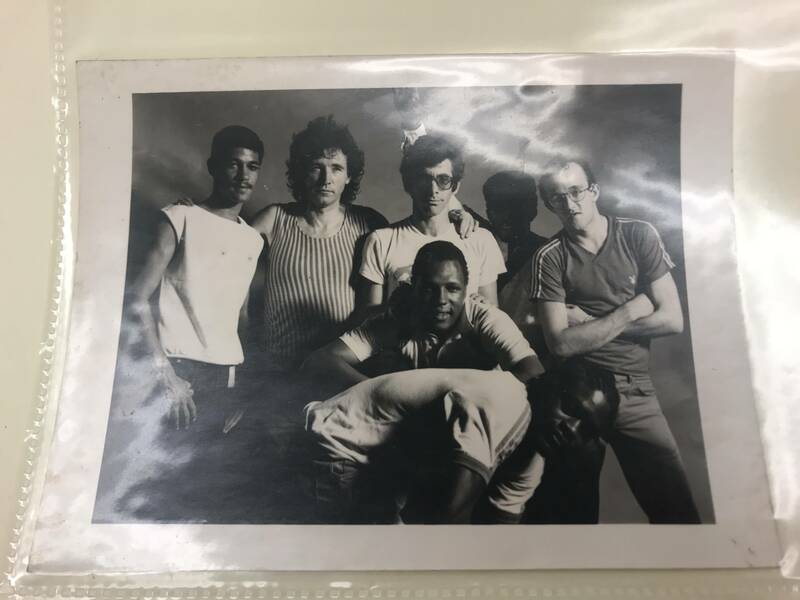 Arguably the most famous of the men in this photo is Keith Haring, whose expression remains stern but somehow ironic, with a hint of playful sarcastic indole. Haring, a downtown SoHo artist at the time, was enthralled by the idea of taking his highly graphic, experimental style uptown. Many of the material that he produced while he was presenting at the space in the early 1980s remains only as rudimentary, yet compelling drawings. They are divided in panels that seem to be loosely related, like silent, abstracted comics, a worthy precedent to his larger-than-life, extremely colorful magnum opus works that were to come in the later years. Haring appears to be the only person in the photograph who has reportedly died, making his presence in the snapshot an all more iconic representation of his start in the art world. The drawings he produced for Fashion Moda are currently at New Museum 3, surviving onto this day on display. Wendell Headley, who poses by himself in the bottom part of the picture, went on a different, nonetheless no-lesser compelling path. Headley—who’s real name is Earl Lee Day, wound up becoming an outsider fashion world icon. To this day, he is frequently found on the streets of New York, sporting colorful wigs, frumpy get ups and unconventional collars across the city. Headley defines himself as an ‘avant-garde’ fashion designer, though he has not released any collections available for purchase. Headley remains featured in many contemporary websites, having amounted a special kind of legacy within the city. Lastly, Willie Neal, who poses candidly at the bottom of the photograph on the last row, has remained an enigma. His identity remains unconfirmed and, when searched on the web, his only mentions remain within bidding Fashion Mode archives. While one cannot doubt his influence, an array of mystery surrounds him, making the picture all the more compelling, and truly encompassing it as a three-sixty look at the art world of the mid-1980s.